MotherTouch™ Prenatal Bodywork Certification is a 32-hour comprehensive and holistic Certification program consisting of the MotherTouchFundamentals of Pregnancy Massage and the Pregnancy Massage Practicum. Drawing wisdom from multi-cultural birthing practices, MotherTouch™ offers a truly holistic prenatal massage program addressing both the physiological and emotional changes women undergo as they become Mother. Leslie approaches MotherTouch with reverence and deep appreciation for this rite of passage. Build your confidence during a supervised pregnancy massage clinic! Develop unique skills applicable immediately to your massage practice. Upon successful completion of the extensive hands-on training, lecture, participatory discussion, pregnancy clinic as well as a written exam, the student will be certified as a MotherTouch™ Prenatal Bodywork Practitioner. Must be licensed as massage therapist, or close to completion of massage school. Must purchase and read before class chapters 1-5 of Leslie's book Nurturing Massage for Pregnancy: A Practical Guide to Bodywork for the Perinatal Cycle. Demonstrated understanding of class material. Demonstrated ability to practice bodywork techniques, positioning, draping taught in class. Successful completion of the written quiz. A student may be required to register for individualized mentoring if the instructor perceives the student needs more one-to-one attention for full integration of the class material. There will be no charge for the first hour of mentoring in this case. If further instruction is required, the student may be required to pay up to $40/hour for private tutoring. 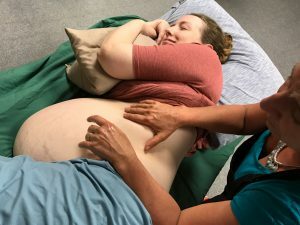 The student reserves the right to receive only the standard 32-hour CE Certificate of Attendance in lieu of the full MotherTouch Prenatal Bodywork Certification.